PERCENTILE in Excel (Formula, Examples) | How to Use This Function? How to Use Excel PERCENTILE Function? The PERCENTILE Function is responsible for returning the nth percentile from a supplied set of values. For example, you can use the PERCENTILE to find the 90th percentile, 80th percentile, etc. 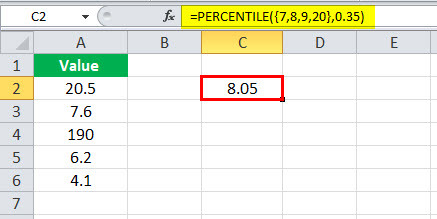 The PERCENTILE in excel is a built-in function of Microsoft Excel and is categorized under the Statistical Function. You can use this function as a worksheet function (WS) in Microsoft Excel, and as a worksheet function, PERCENTILE function can be entered as a part of any other formula in the worksheet cell. In the field of corporate finance, the PERCENTILE is used for analyzing the total number of employees who have scored above a certain percentile in a company test. 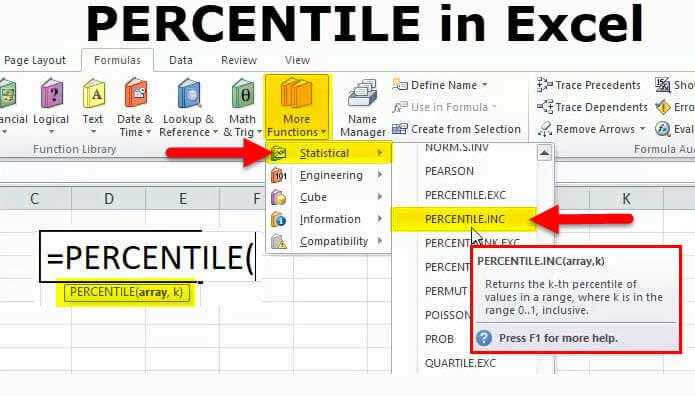 Please note that in the 2010 version of Microsoft Excel, the PERCENTILE Function was replaced by PERCENTILE.INC Function, and in the latest versions of Excel, the PERCENTILE is still available as compatibility. Below is PERCENTILE Formula in Excel. 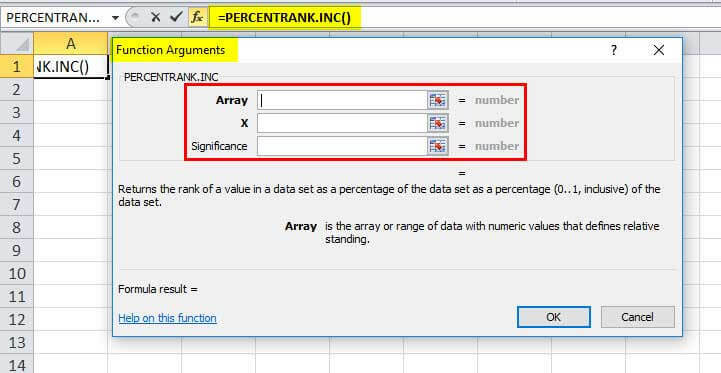 array – This is the range or array from which you want the function to return the nth percentile. It is required. nth_percentile – This is a number between 0 and 1 which specifies the percentile value. The return value of the PERCENTILE Function in excel is a numeric value. Please note that if the nth_percentile is not a numeric value, then you will get a #VALUE! error. Also, if the nth_percentile value is not between 0 and 1, and is greater than 1 or less than 0, then the PERCENTILE Function will be returning #NUM! error. The PERCENTILE Function is responsible for calculating the “nth percentile” for a supplied set of data. A percentile which is calculated with 0.4 as n means 40% of the values are either less than or equal to the result which is calculated. Similarly, a percentile calculated with 0.9 means 90%. You can also specify n as a percent directly by using the % character in the formula. For example, =PERCENTILE (range, 80%) will be 80 percentile. “n” can be provided as either decimal or percentage. You should also know that when the percentiles fall between values, the function will interpolate and the return value will be an intermediate value. How to Open PERCENTILE Function in Excel? 1) You can simply enter the desired PERCENTILE function formula in the required cell to attain a return value on the argument. 2) You can manually open the PERCENTILE formula dialogue box in the spreadsheet and enter the logical values to attain a return value. 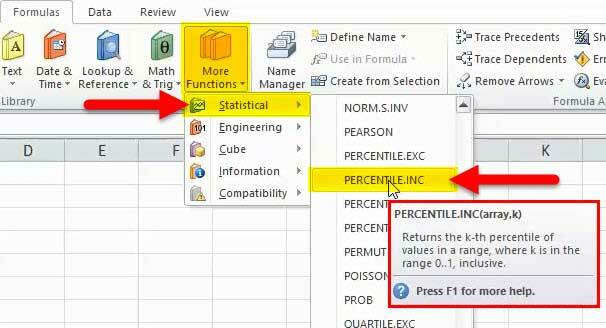 3) Consider the screenshot below to see the PERCENTILE option under the Statistical Function excel menu. 4) Click on the PERCENTILE.INC option. The PERCENTILE formula dialogue box will open where you can put the argument values to obtain a return value. Let’s look below at some of the examples of PERCENTILE function. 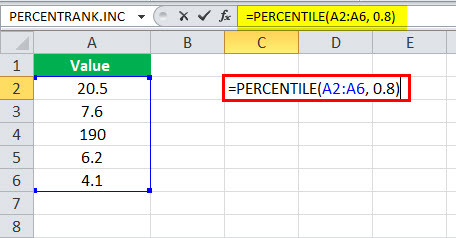 These examples will help you in exploring the use of PERCENTILE function in Excel. Based on the above Excel spreadsheet, let’s consider these examples and see the PERCENTILE function return based on the syntax of the function. Consider the below screenshots of the above examples for clear understanding. #NUM! – This kind of error occurs when the supplied value of n is less than the numerical value 0 or greater than 1. Apart from this, this error can also occur if the supplied array is empty. #VALUE! – This kind of error occurs when the supplied n is a non-numeric value. It is the function which is responsible for returning the nth percentile from a supplied set of values. It is categorized under the Statistical Function. 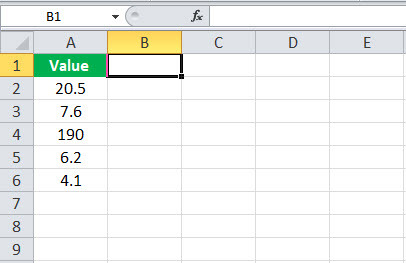 This function has been replaced by PERCENTILE.INC Function, and in the latest versions of Excel, the PERCENTILE Function is still available as compatibility. If the nth_percentile is not a numeric value, then you will get a #VALUE! error. If the nth_percentile value is not between 0 and 1, and is greater than 1 or less than 0, then the PERCENTILE Function will be returning #NUM! error. The value of n should be between 0 and 1. A percentile which is calculated with 0.4 as n means 40% of the values. n” can be provided as either decimal or percentage. For example, 0.8 = 80%, 0.9 = 90% and so on. If n is not a multiple of 1/ (n – 1), PERCENTILE interpolates to determine the value at the nth percentile.